M. R. Carman, Colarusso, P. D., Grunden, D. W., Wong, M. C., McKenzie, C., Matheson, K., Davidson, J., Heinig, C., Fox, S., Neckles, H., Schott, S., Pickerell, C., and Dijkstra, J. A., “Distribution and diversity of invasive tunicates on eelgrass in eastern North America: A latitudinal study between N 40° and N 50°, New Jersey to Newfoundland”, EPA, Eelgrass Conference. Boston, MA, USA, 2014. C. E. Parrish, Rogers, J., Ward, L. G., and Dijkstra, J. A., “Enhanced coastal mapping using lidar waveform features”, 15th Annual JALBTCX Airborne Coastal Mapping and Charting Workshop. Mobile, AL, 2014. P. Johnson and Jerram, K., “E/V Nautilus EM302 Multibeam Echosounder System Review”, 2014. J. A. Dijkstra and Litvaitis, M., “Evolutionary response of colonial invertebrates to temperature in the Gulf of Maine”, International Invasive Sea-Squirt Conference. Woods Hole, MA, 2014. D. Miao, “Gradual Generalization of Nautical Chart Contours with a B-Spline Snake Method”, University of New Hampshire, Durham, NH, 2014. A. Chase, Dijkstra, J. A., and Harris, L., “The influence of substrate identity on ascidian larval settlement preference and fouling community development”, International Invasive Sea-Squirt Conference. Woods Hole, MA, 2014. L. G. Ward and Irish, J. D., “Morphologic Changes of a Heavily Developed and Modified Back-Barrier System: Hampton-Seabrook Harbor, New Hampshire”, Geological Society of America Annual Meeting. Vancouver, British Columbia, Canada, 2014. P. Johnson, Beaudoin, J., and Ferrini, V. L., “Multibeam Advisory Committee (MAC) – Three Years of Working Towards the Consistent Acquisition of High Quality Multibeam Echosounder Data Across the US Academic Fleet”, AGU Fall 2014. San Francisco, CA, 2014. G. Bortoluzzi, Spagnoli, F., Aliani, S., Romeo, T., Canese, S., Esposito, V., Grassi, M., Masetti, G., Dialti, L., Cocchi, L., Muccini, F., Lacono, V., Yakimov, M., La Spada, G., Ligi, M., Giordano, P., Franchi, F., Ferrante, V., Borgognoni, L., Tudino, T., Guideri, M., Ivaldi, R., Pratellesi, M., Marziani, F., Niccolini, F., Barbieri, E., Capaccioni, B., and Andaloro, F., “New geological, geophysical and biological insights on the hydrothermal system of the Panarea – Basiluzzo Volcanic complex (Aeolian Islands, Tyrrhenian Sea)”, SGI-SIMP 2014. Milan, Italy, 2014. M. Aslaksen and Parrish, C. E., “New Topographic-Bathymetric Lidar Technology for Post-Sandy Mapping”, Canadian Hydrographic Conference. St. John’s, Newfoundland, Canada, 2014. J. A. Dijkstra and Simkanin, C., “Phenotypic and reproductive trade-offs of colonial invertebrates to salinity”, International Invasive Sea-Squirt Conference. Woods Hole, MA, 2014. M. Grassi, Masetti, G., Dialti, L., Bortoluzzi, G., Filippone, M., Ricci, E., Pratellesi, M., Spagnoli, F., Borgognoni, L., Tudino, T., Aliani, S., and Battaglia, P., “Rapporto sulle attivita’ oceanografiche, geochimiche, geologiche, geofisiche e di campionamento durante la crociera PANA13 con ITS Magnaghi : Panarea, I.Eolie, Tirreno S.Orientale, 2013-06-02- 2013-06-08.”, RAPPORTI ISMAR, Roma, Italy, 2014. K. Colbo, Ross, T., Brown, C., and Weber, T. C., “A Review of Oceanographic Applications of Water Column Data from Multibeam Echosounders”, Estuarine, Coastal and Shelf Science, vol. 145. pp. 41-56, 2014. 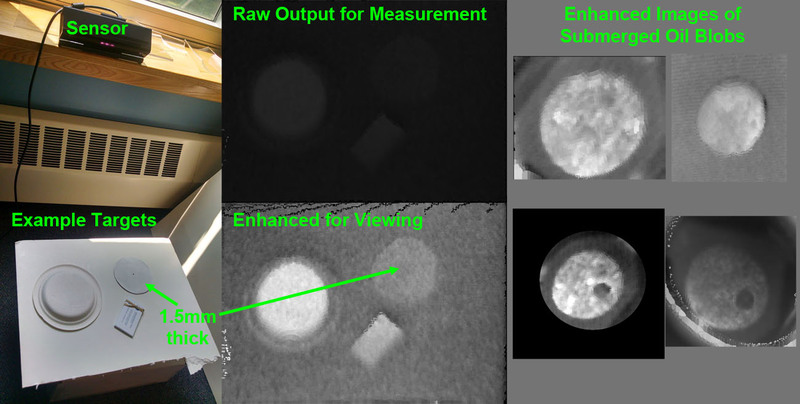 P. Johnson, “R/V Falkor Multibeam Echosounder System Calibration”, 2014. J. Beaudoin, Johnson, P., and Flinders, A. F., “R/V Falkor Multibeam Echosounder System Review”, 2014. P. Johnson, Flinders, A. F., and Greenaway, S. F., “R/V Sikuliaq EM302 & EM710 Multibeam Echosounder System Shipboard Acceptance Tests - SKQ201400L3”, 2014. P. Johnson and Jerram, K., “RVIB Nathaniel B Palmer EM122 Multibeam Sea Acceptance Trials - NBP1405”, 2014. S. Pe'eri, Smith, S. M., Snyder, L. P., and Madore, B., “Satellite-Derived Bathymetry Using Multiple Images: The Alaska North Slope Case Study”, 2014 Canadian Hydrographic Conference. St. John's, NF, Canada, 2014. S. Pe'eri, Tibor, G., Madore, B., Illin, V., Ben-Avraham, Z., Rilov, G., Ketter, T., and Dijkstra, J. A., “Seafloor characterization and monitoring of the inner shelf in northern Israel using remote sensing”, Ocean Optics XXII. Portland, ME, 2014. J. Miksis-Olds, Bradley, D. L., and Niu, X. M., “Decadal Trends in Indian Ocean Ambient Sound”, Journal of the Acoustical Society of America, vol. 134. Acoustical Society of America, pp. 3464-3475, 2013. G. Imahori, Pe'eri, S., Parrish, C. E., Wozumi, T., White, S. A., Jeong, I., and Macon, C. L., “Developing an acceptance test for non-hydrographic airborne bathymetric lidar data application to NOAA charts in shallow waters”, US Hydrographic Conference 2013. THSOA, New Orleans, LA, USA, 2013. J. A. Dijkstra and Brown, C., “Effect of morphological transformation on habitat structure and associated species”, Benthic Ecology Meeting. Savnnah, GA, 2013. G. Imahori, Pe'eri, S., and Parrish, C. E., “Evaluating the USACE's NCMP for NOAA charting operations”, JALBTCX 14th Annual workshop. Mobile, AL, 2013. L. Brothers, VanDover, C. L., German, C. R., Kaiser, C. L., Yoerger, D., Ruppel, C., Lobecker, E., Skarke, A., and Wagner, J. K. S., “Evidence for extensive methane venting on the southeastern U.S. Atlantic margin”, Geology, vol. 41. pp. 807-810, 2013. J. A. Dijkstra, “Facilitation of native and non-native species by intermediate foundation species”, Coastal and Estuarine Research Federation. 2013. J. A. Dijkstra, Lambert, W. J., and Harris, L. G., “Introduced species provide a novel temporal resource that facilitates native predator population growth”, Biological Invasions, vol. 15. pp. 911-919, 2013. C. E. Parrish, “Lidar Waveform: A Practical Perspective”, American Society for Photogrammetry and Remote Sensing (ASPRS) Annual Conference. 2013. J. Beaudoin, “Multibeam Advisory Committee -- Improving Data Quality Across the US Academic Fleet”, FEMME-2013. Boston, MA, United States, 2013. K. Jerram, Weber, T. C., and Beaudoin, J., “Observing natural methane seep variability in the northern Gulf of Mexico with an 18-kilohertz split-beam scientific echosounder”, Proceedings of Meetings on Acoustics, vol. 19. 2013. J. Beaudoin, “Oceanographic Weather Maps: Using Oceanographic Models to Improve Seabed Mapping Planning and Acquisition”, US Hydrographic Conference 2013. THSOA, New Orleans, LA, USA, 2013. S. Pe'eri and Shwaery, G., “Radiometric and Photometeric Determinations of Simulated Shallow-Water Environment”, International Journal of Remote Sensing, vol. 34(18). Taylor & Francis, pp. 6437-6450, 2013. C. M. McIntyre, Pappal, A. L., Bryant, J., Carlton, J. T., Cute, K., Dijkstra, J. A., Erickson, R., Garner, Y., Gittenberger, A., Grady, S. P., Haram, L., Harris, L., Hobbs, N. V., Lambert, C. C., Lambert, G., Lambert, W. J., Marques, A. C., Mathieson, A. C., McCuller, M., Mickiewicz, M., Pederson, J., Rock-Blake, R., Smith, J. P., Sorte, C., Stefaniak, L., and Wagstaff, M., “Report on the 2010 rapid assessment survey of marine species at New England floating docks and rocky shores.”, Office of Coastal Zone Management, Boston, Massachusetts, 2013. C. Carmisciano, Grassi, M., Cocchi, L., Masetti, G., Filippone, M., Ricci, E., Pratellesi, M., Ivaldi, R., Iannaccone, G., Berrino, G., De Natale, G., Chiodini, G., Caliro, S., Dialti, L., Guideri, M., Muccini, F., Stefanelli, P., Orsi, G., Iafolla, V., Italiano, F., Buongiorno, F., Stramondo, S., Bignami, C., Polcari, M., and Silvestri, M., “RICAMAR2013: Rilievi per la caratterizzazione dell'ambiente marino nel Golfo di Pozzuoli. Rapporto sull'attività. 13 - 31 maggio 2013”, Rapporti Tecnici INGV (ISSN 2039-7941), 2013. S. Pe'eri, “Satellite-Derived Bathymetry as a Reconnaissance Tool for Hydrography”, Hydro International, vol. 17(7). pp. 16-19, 2013. S. Pe'eri, Tibor, G., Madore, B., and Ketter, T., “Satellite-derived bathymetry of the Achziv coastal area, northern Israel”, The 10th Annual Meeting of the Israeli Association for Aquatic Sciences. 2013. C. Lanzoni and Weber, T. C., “Calibration of multibeam echo sounders: a comparison between two methodologies”, 11th European Conference on Underwater Acoustics, Edinburgh, Scotland. 2012. J. M. Jech, Boswell, K., Barao, T., Condiotty, J., Melvin, G., Taylor, J., Wakefield, W., and Weber, T. C., “Calibration of two orthogonal dual-frequency identifications onars (DIDSONS)”, 11th European Conference on Underwater Acoustics, Edinburgh, Scotland. 2012. M. S. Boettcher, Wolfson-Schwehr, M. L., Forestall, M., and Jordan, T., “Characteristics of Oceanic Strike-Slip Earthquakes Differ Between Plate Boundary and Intraplate Settings”, 2012 Fall Meeting, American Geophysical Union (AGU). 2012. B. M. Sullivan, “ChUM: Chart Update Mashup”, IEEE Oceans. IEEE/MTS, Hampton Roads, VA, 2012. G. A. Rice, Weber, T. C., and Pirtle, J. L., “Descriptive Report to Accompany NOAA Ship Oscar Dyson 2011”, 2012. 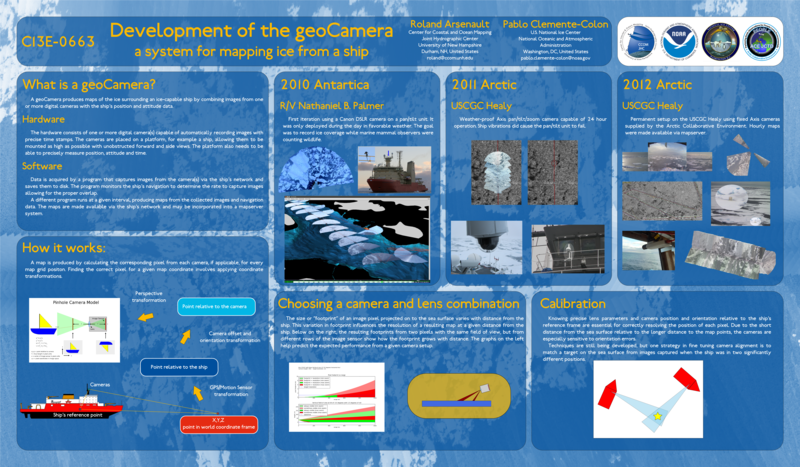 R. Arsenault and Clemente-Colon, P., “Development of the geoCamera, a system for mapping ice from a ship”, 2012 Fall Meeting, American Geophysical Union (AGU). San Francisco, CA, United States, 2012. A. L. Forrest, Hamilton, A. K., Schmidt, V. E., Laval, B. E., Mueller, D., Crawford, A. J., Brucker, S., and Hamilton, T., “Digital terrain mapping of Petermann Ice Island fragments in the Canadian High Arctic”, 21st IAHR International Symposium on Ice: "Ice Research for a Sustainable Environment". Dalian, China, 2012. F. Eren, Thein, M. - W., Celikkol, B., Pe'eri, S., and Decew, J., “Distance Detection of Unmanned Underwater Vehicles by Utilizing Optical Sensor Feedback in Leader-Follower Formation”, IEEE/MTS Oceans. IEEE/MTS, Hampton Falls, VA, 2012. C. M. Bachmann, Montes, M. J., Parrish, C. E., Fusina, R. A., Nichols, R. C., Li, R. - R., Hallenborg, E., Jones, C. A., Lee, K., Sellars, J., White, S. A., and Fry, J. C., “A dual-spectrometer approach to reflectance measurements under sub-optimal sky conditions”, Optics Express, vol. 20. The Optical Society (OSA), 2012. J. L. Pirtle, Weber, T. C., Wilson, C. D., Rooper, C., and Heifetz, J., “Essential Fish Habitat Project Status Report: Low-cost multibeam mapping to support habitat based groundfish assessment and deepwater coral research in the Gulf of Alaska”, NOAA Alaska Fisheries Science Center, Seattle, WA, USA, 2012. R. Hare, Hughes Clarke, J. E., Whittaker, C., Broadus, M., Martinolich, R., and Beaudoin, J., “Establishing a Multibeam Sonar Evaluation Test Bed near Sidney, British Columbia”, 2012 Canadian Hydrographic Conference. Niagara Falls, Ontario, Canada, 2012. D. T. Jones, Wilson, C. D., De Robertis, A., Rooper, C., Weber, T. C., and Butler, J. L., “Evaluation of rockfish abundance in untrawlable habitat: combining acoustic and complementary sampling tools”, Fishery Bulletin, vol. 110. pp. 332–343, 2012. L. Brothers, Van Dover, C., German, C. R., Yoerger, D., Kaiser, K., Lobecker, E., Skarke, A., and Ruppel, C., “Evidence of Extensive Gas Venting at the Blake Ridge and Cape Fear Diapirs”, 2012 Fall Meeting, American Geophysical Union (AGU). San Francisco, CA, United States, 2012. K. Jerram, Weber, T. C., and Beaudoin, J., “Exploring the capabilities of an 18-kHz split-beam scientific echosounder for water column mapping and seafloor positioning of methane seeps in the northern Gulf of Mexico.”, The Journal of the Acoustical Society of America. 2012. G. Masetti, “A Geo-database for Potentially Polluting Marine Sites and Associated Risk Index”, University of New Hampshire, Durham, NH, 2012. J. L. Pirtle, Eckert, G. L., and Stoner, A. W., “Habitat structure influences the survival and predator-prey interactions of early juvenile red king crab Paralithodes camtschaticus”, Marine Ecology Progress Series, vol. 465. pp. 169-184, 2012. T. Karlsson, Pe'eri, S., and Axelsson, A., “The Impact of Sea State Condition on Airborne Lidar Bathymetry Measurements”, SPIE Defense, Security and Sensing (Laser Radar Technology and Applications XVII). Baltimore, MD, 2012. P. Johnson, Beaudoin, J., and Ferrini, V. L., “Improving Multibeam Data Quality Across the U.S. Academic Research Fleet”, 2012 Fall Meeting, American Geophysical Union (AGU). San Francisco, CA, USA, 2012. S. Pe'eri and Shwaery, G., “Light Field and Water Clarity Simulation of Natural Environments in Laboratory Conditions”, SPIE Defense, Security and Sensing (Ocean remote sensing and monitoring IV ). Baltimore, MD, 2012.